It wouldn’t be the Kardashian clan if they weren’t making headlines, but Kim Kardashian West’s recent onslaught on the world of ‘fast fashion’ has had some fashion onlookers smelling a shiny golden rat. For the family that can sell anything, the speed of it all raised a few eyebrows, and the Instagram from Missguided was hastily deleted, but not before Diet Prada—an account with 1.2m followers that posts images of “ppl knocking each other off lol”—captured it and accused all involved of some foul play. 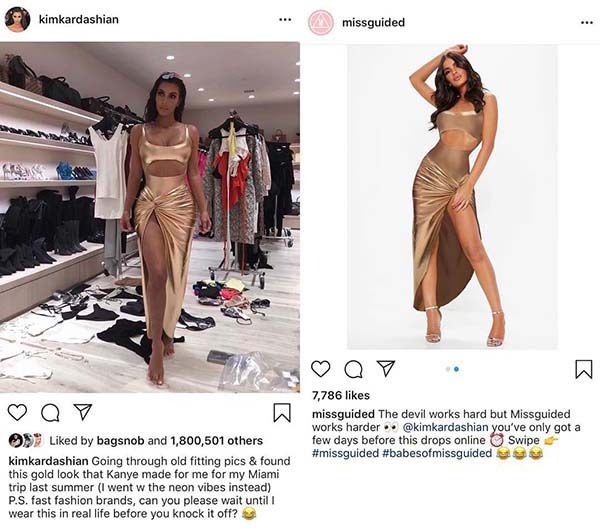 That members of the Kardashian have been known to endorse Missguided in the past—along with other fast fashion brands Pretty Little Thing, Boohoo and Fashion Nova—did not go unnoticed. Whatever the case, Kardashian Incorporated will march on, and likely ‘knock off’ someone else themselves before too long. What goes around comes around, and in their world it’s typically an awful lot of money. Spare a thought for the ‘little guys’ who are regularly knocked off and swiped aside by conglomerates for who plagiarism is a nonconcern. Major retailers routinely rip-off the work of independent creatives who commonly know little about international copyright laws, can’t afford lawyers, and sometimes don’t even realise. 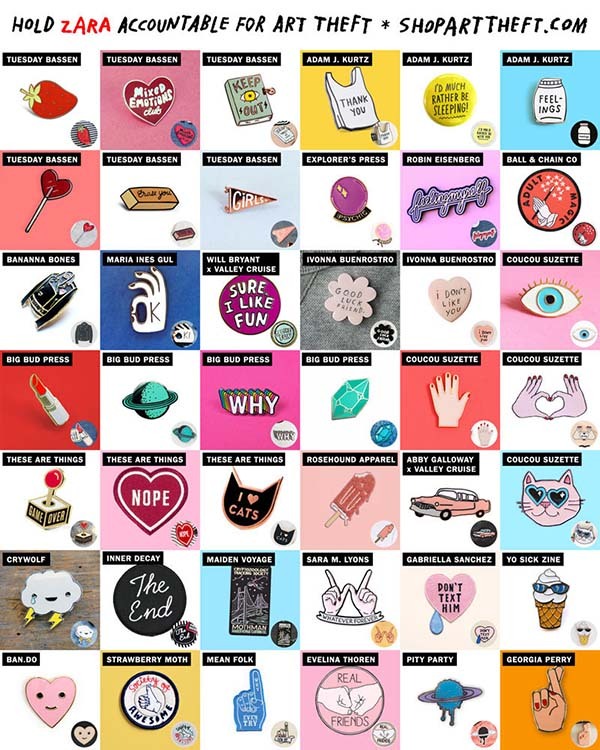 When Zara was accused by Tuesday Bassen of stealing her designs back in 2016, it caused a justified outcry on Instagram and beyond—the Los Angeles-based designer and illustrator having called out the gargantuan Spanish fashion retailer in a post that displayed examples of her work side-by-side with Zara copies. Receiving over 42,500 likes and a slew of comments—including those by other designers who claimed the brand (as well as others in Amancio Ortega and Rosalía Mera’s Inditex group) had too ripped off their designs—fans of the ‘fast fashion’ chain appeared to turn their backs on the conglomerate, declaring “Zara can shove it”, and “I’ll never enter another Zara store again”. The brand themselves did little to help themselves, Bassen showing an image of a condescending response that, to all intents and purposes, told the designer that she wasn’t famous enough to have her work stolen. Over $2,000 on legal fees later, the tenacious designer started to make progress, the Inditex group opening an enquiry and seeking to resolve the situation with Bassen and other instances of alleged plagiarism as swiftly as possible. Adam J. Kurtz began a campaign to expose fashion theft after the store Bershka stole one of his works. Informed by fans of his work that the Zara subsidiary were selling exceedingly similar pin designs to his own, he only realised how rife the problem was when he read Bassen’s story; the pair eventually working together to uncover more and more cases. The culmination of this collaborative David vs. Goliath fight-back was Kurtz launching the website shoparttheft.com, which highlights just how common plagiarism is in the industry, and urges the public to purchase the original creatives’ work over big brand theftery. 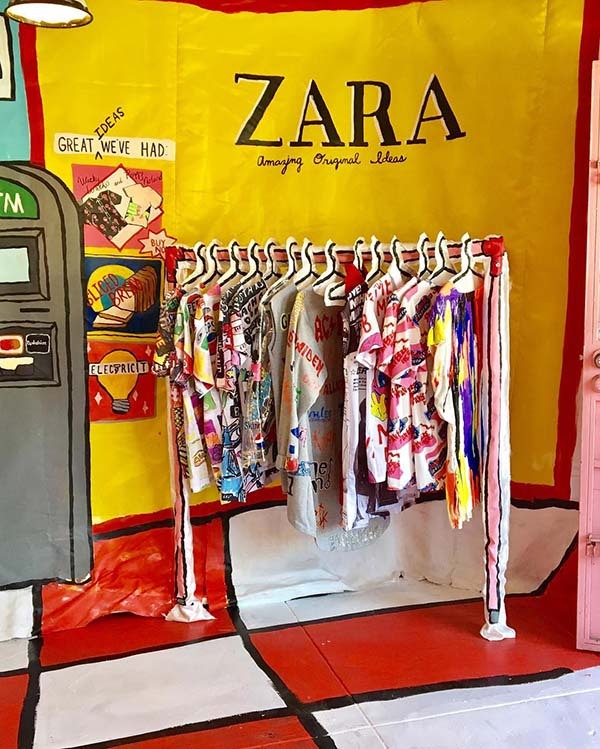 Filling clothes hangers with knock-offs they’d found online—modelling the shop on Zara due to the timing of the Bassen case—designers of fashion theft were also invited to sell their goods alongside the Zara pieces that were being sold at inflated prices such as $200 to $400 compared to the $20 to $40 they’d go for in one the chain’s thousands of outlets; the profits were donated to groups who campaign for workers’ rights. Another case in 2016 saw Brother Vellies founder, Aurora James, pointing the finger of blame firmly at Zara for ripping off her company’s stunning Dhara Sandals. Based in Brooklyn, making and selling boots, shoes and sandals that introduce the world to her favourite traditional African footwear—whilst creating and sustaining artisanal jobs on the continent—the Canadian-born designer uploaded a photo from Zara on her personal Instagram account with the caption “Stolen from Africa”; letting it be known how personal this theft was to her. Although the Zara version couldn’t compare in the style stakes, there’s no denying where the idea behind these cheap and nasty knock-offs had originated. 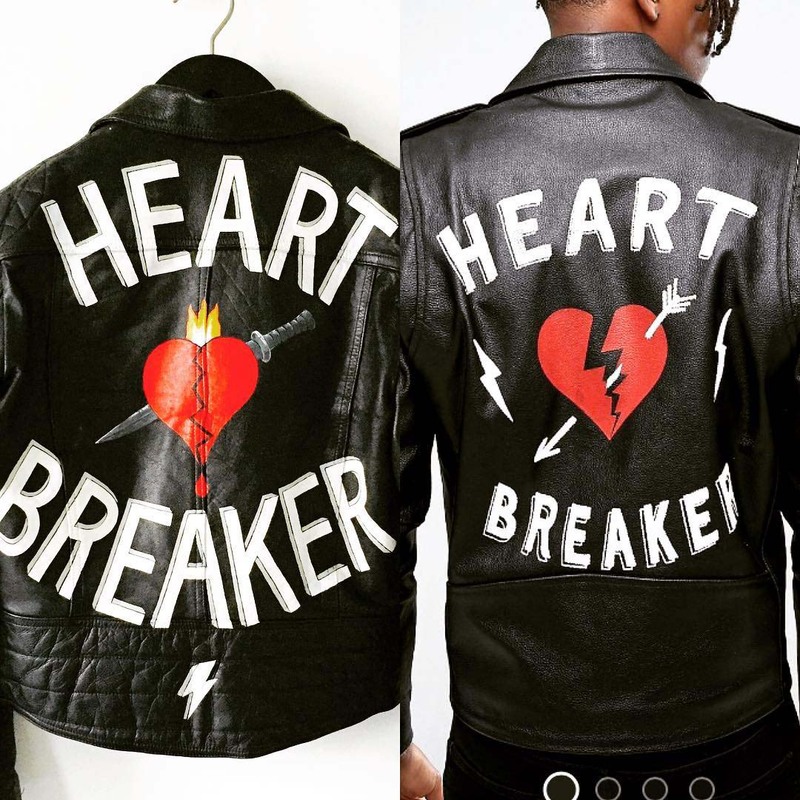 With stores such as Selfridges & Co, Fenwick of Bond Street and Bergdorf Goodman stocking her leather label with a twist, Laurie Lee transforms everyday pieces into wearable art, her leather jackets featuring traditional craft of hand-painted lettering and pop culture iconography. Recalling how ASOS had visited her showroom at a previous London Fashion Week and photographed her collection, Lee went on to call out their subsequent plagiarism, showing the two jackets side-by-side before sending a literal middle finger to the retail giant in a subsequent post. Laurie Lee’s original design on the left, with ASOS’s fast fashion knock-off on the right. Of course it’s not just fast fashion that struggles for its own ideas. Fashion house Gucci claimed they were paying homage to Harlem-born fashion designer and haberdasher Dapper Dan rather than plagiarising him when they copied a design (that Olympic gold medalist Diane Dixon wore for him in 1989) in a cruise collection show some years later. A bootlegger himself, Dapper Dan incorporated high-end logos onto clothes throughout the ‘80s, notching up some big name clients including Mike Tyson and Eric B. and Rakim, creating the jackets for the sleeve of their iconic Paid in Full. In another Instagram post, photographer Kevin Harry states: “Props and respect to the legendary Harlem tailor Dapper Dan whose brilliant Louis Vuitton ‘knockoff’ jacket from the 80’s….was ‘knocked off’ by Gucci for the resort collection shown in Florence yesterday.” Once called a ‘natural born hustler’ in a Dazed interview, Dan turned it all to his advantage and is now a frequent collaborator with the Italian powerhouse. Sadly not all creatives have the clout of our friend Dapper, and luxury brands like Gucci are just as guilty as helping themselves to smaller designer’s works as the high streets giants—Jeremy Scott having been sued by Santa Cruz-based graphic artist Jimbo Phillips for using a selection of his designs for his Fall 2013 collection. Later issuing a statement apologising for ‘his mistake’, it appears this mistake was forgotten a couple of years later, when Scott was once again sued; this time by street artist Rime for using the artist’s work on a Moschino collection. 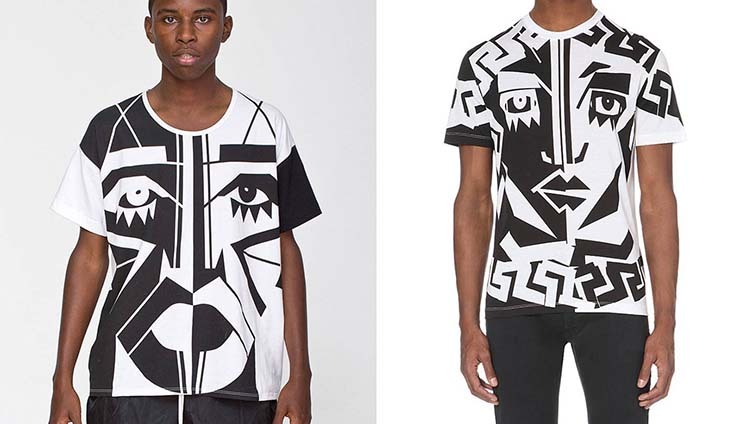 Kesh’s original vs. the Versace rip-off. Versace too have been called out for dabbling in a little bit of plagiarism, having premiered a t-shirt that looked suspiciously like one fashion designer Kesh created in collaboration with American Apparel—Kesh herself declaring “at least make it better than the $30 original @versace. this looks like a first draft” before going on to describe how the rip-off had hurt her both financially and emotionally. Unlike the music industry, where strict copyright laws have slapped the likes of Robin Thicke and Pharrell Williams hard, plagiarism in design is a much tougher ask to prove; especially so with the financial disparity of a Zara and a Tuesday Bassen; social media, though, has allowed creatives to at least alert the public to such wrongdoings. Want to help? Vote with your feet, bypass arrogant mega-brands in favour of independent creatives, get thrifting. Don’t let the bastards grind you down.